What actually transpires for engaged couples between the time they utter the words “Let’s get married” until the actual words “I do” finalize the union? After the initial proposal, the lives of all concerned with planning the wedding are forever transformed. Though people rarely know all that is truly involved behind the scenes (unless they have experienced it firsthand) they quickly learn that this event is not one for the faint of heart. The pace for the bride and other family members is often frenetic, and emotions run at full throttle to accomplish the “perfect” wedding. Probably THE most anxiety provoking event in the whole process for the bride-to-be is her choice of a wedding dress. Juxtaposed against her tears of joy and hopes and dreams of wedded bliss, is the pronounced importance of choosing the right dress. This may sound like a fairly easy task: gather family/friends, enter bridal shop, try on several gowns, have a fitting or three, and pick up the dress; however, this simple, logical sequence could not possibly describe what occurs in real life during the process of choosing the proper dress to suit each individual woman. 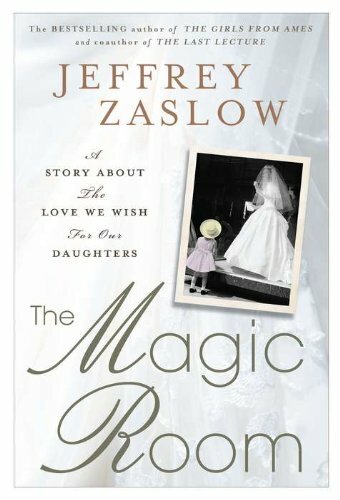 Author Jeffrey Zaslow brilliantly examines how the love (or lack thereof) we give to our daughters affects their lives and choices they make regarding their prospective mates. The Magic Room depicts a slice of life that contains an intriguing history of seven decades of a family business dedicated solely to brides and their entourages during the most exciting time in their lives. A potential reader should not dismiss this book as a simple story about weddings and the concomitant frenzy. It is so much more than that on every level. Not only is the reader able to delve into the minds of family relationships at their core. Additionally, the history of marriage and family values are discussed in relation to the current trends in marriage set against the landscape of the constantly evolving American society. The backdrop for this insightful book is Becker’s Bridal Shop located in the small town of Fowler, Michigan. More specifically, Becker’s Bridal Shop houses what is referred to as the Magic Room, in which women by the hundreds (from distant destinations) congregate at this oasis like their mothers and grandmothers before them. After all, the shop has been owned by three generations of the Becker family—and is rumored to be eerily haunted by the presence of every previous bride that has stood in the Magic Room. After exiting the bridal dress area, each woman gingerly steps up on the beloved pedestal of the sacrosanct sanctuary surrounded by mirrors sparkling from every angle to view the bride in all her bejeweled glory. Mr. Zaslow’s choice of conveying his messages about love and hope through the real lives of women about to wed is thoroughly engaging. One poignant example is that of Megan who, just four months before her wedding, was in a tragic car accident in which she was violently thrust through the windshield. One finger was severed and her right hand was mangled. She had only been engaged for about a week before the accident. But in the midst of excruciating skin grafts, plastic surgeries and a painful recovery, her fiancé held steadfast in his love and dedication to her. Their wedding day was a celebration of gratitude toward both life and a new path ahead. As her mother stated wisely: “Just because the accident happened during Megan’s engagement doesn’t mean she isn’t starting out with a perfect life. Perfect doesn’t mean unflawed or without challenges or that bad things won’t happen.” The pictures of Megan and Shane hand-in-hand at their wedding could prompt even the most cynical person to shed a tear or two. In The Magic Room, Jeffrey Zaslow has created a symphony of synchronistic stories with great aplomb, engendering the gamut of emotions for the reader—from joy to sorrow and ultimately arriving at a sense of serenity. With all the negative stories surrounding us, there exist a few books that allow us to retreat into a positive space, that beckon us to read further out of sheer enjoyment, and that leave us with a sense of having participated in something heartlifting and worthwhile.